The next day, after flipping tables in the temple, Jesus enters the Temple again. He is confronted by the chief priests and elders about his actions and his teachings. They ask him "Who gave you the authority to do these things?!" Jesus, as is his style, doesn't answer directly but asks them a question in return. He says "I will tell you that if you tell me this one thing, was John's baptism from heaven or was it simply of human origin?" This question stumps them because they know that if they say that John was a prophet he will just ask why they didn't believe him and if they say he was not a prophet the people will revolt, for they all revered him as such. So like any good politician they take neither stance and simply say "I don't know" to which Jesus replies "then neither will I tell you by what I authority I do what I do." We often stop reading there but Jesus continues and asks them "What do you think about this? A Man has two sons; he went to the first and said, "Son, go and work in the vineyard today." The son says "no" to his father but later feels bad, changes his mind and goes out and does the work. The father asked the second son to do the same thing and that son said "Of course, sir. I will." but then he does not go and do anything. Jesus then asks these religious leaders "Which son did the will of his father?" They answered him "The first." Jesus then says "I am seriously telling you the truth when I say that the tax collectors and prostitutes (read all these people you consider terrible sinners) are going into the kingdom of God ahead of you. John came to you in righteousness and you did not believe him, but they did, and even after you see what that has meant for them you will not change your minds and believe him?" John had said very clearly to religious leaders who came to him "Even now the ax is lying at the root of the trees; every tree therefore that does not bear good fruit is cut down and thrown into the fire." Your religious piety, your services and your rituals are the empty words of the second son. You do not do the will of the Father, and you do not take care of his sheep, his children, the family that he loves. Jesus continues his assault as he tells another story of a landlord whose tenants kill everyone he sends to collect fruits of the harvest, finally even killing his own son. He asks them "when the owner comes what will he do with those tenants?" Still seeming to not get this is outright accusation the answer "He will put those wretches to a miserable death and lease the vineyard to better tenants" As if to say you are exactly right Jesus just quotes Psalm 118 with those familiar words: "The stone that the builders refused has become the head cornerstone" He then continues "Therefore I tell you, the kingdom of God will be taken away from you and given to a people that produce the fruits of the kingdom." Dang. Those first sons, who's lives seem to say no to God, but who love and forgive and share and cry and look up and know that they are desperate, they are the ones to whom my kingdom belongs. These are the children he is defending when he flips those tables, these are the children he is stopping to heal, and these are the children who cry out "Hosanna!" Today we see Jesus continue to go push and push on the establishment which will inevitably lead to his execution. He does not back down or shy away in speaking truth to power. Even in the parable he tells them about the landlord and the tenants he is pointing out that they and their ancestors have killed every prophet that God sent to them and that in the end will even kill his very son. Jesus knows exactly what he is doing and it is not what anyone expects. Κύριε Ἰησοῦ Χριστέ, Υἱὲ τοῦ Θεοῦ, ἐλέησόν με τὸν ἁμαρτωλόν. 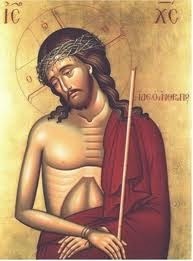 Lord Jesus, Son of God, have mercy on me, the sinner.